Those were the days in Tribeca, when an artist could get 30 guys together and spray paint a bridge with a trio of vivid colors—legally. August marked the 35th anniversary of Hudson Summer Sunset, the site-specific work of artist A. Eric Arctander, who died in 2013 at age 68. The year before, Arctander had carried out a project that called for painting the original shoreline of Lower Manhattan, from Pearl Street around The Battery and up Greenwich Street. Then he set his sights on the rusty bridge, which spanned Canal Street along an elevated, and later-to-be-demolished, section of the West Side Highway. “He really used Lower Manhattan like his coloring book,” she added. 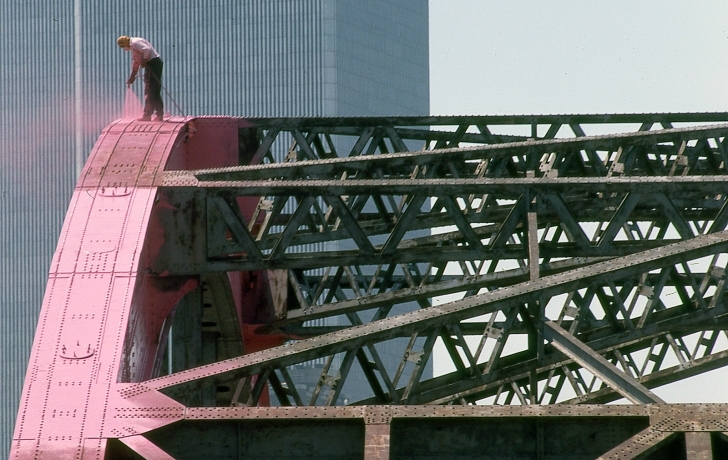 With union bridge painters donating their labor and a $4,500 grant from ITT World Communications, Arctander and workers climbed the span’s arches, painting one side pink, the other plum, the “colors of the setting sun,” Arctander said. Blue was applied to both edges of the roadbed. It took 140 gallons of paint to complete the job on Saturday, Aug. 1, 1981. Arctander also convinced ironworkers to place a 72-foot steel I beam from the edge of the road to the top of the bridge’s arc, marking the location of the sun as it set on the summer solstice. It was all done with the blessing of Community Board 1 and the city’s Department of Transportation. The next day, the New York Times reported on the event. “As the morning wore on and the area’s residents, many of them artists, emerged from their converted warehouses, reactions to the project ranged from pleasantries to fury,” the paper said. The Times quoted one resident as saying that the artist should have consulted the neighbors about his choice of colors. Others complained to Arctander directly. “These are ’60s colors,” one said. “The colors are sort of passé, but I like it,” a passerby noted. Like it or not, the next year the multi-colored bridge—along with a section of the elevated roadway from Spring Street to the Battery—was gone.